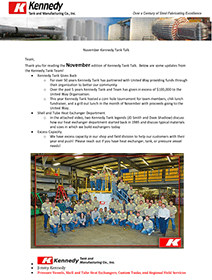 Kennedy Tank & Manufacturing Co., Inc. is your comprehensive source for TEMA Shell and Tube Heat Exchangers, custom fabricated ASME Code Pressure Vessels, custom steel tanks, API-650 storage tanks, ASME Columns, and single and double wall UL 142 tanks and 2085 fireguard tanks ALL in a variety of steel and alloy materials. When you work with Kennedy, you can be assured of unsurpassed quality and reliability in our products and excellence in our service. 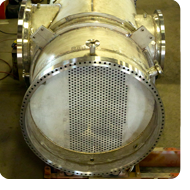 We design and fabricate custom shell and tube heat exchangers to meet a variety of industrial needs. In addition to meeting your application specifications, our shell and tube heat exchangers can be engineered, designed, and fabricated to meet ASME code. Our capabilities include the design of custom pressure vessels to meet a wide range of requirements, including extremely large capacities and thicknesses. Our experience includes building custom pressure vessels in a variety of materials to solve a broad array of challenging applications. 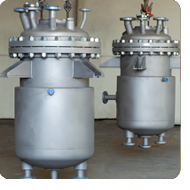 We design and manufacture custom steel tanks for a wide range of applications. Whether your application involves high or low temperature or pressure ratings, or requires special paint or linings, we fabricate custom steel tanks to your precise specifications. Kennedy Tank is your full service source, offering the advantages of design and manufacture capability, product diversity, and service capability. 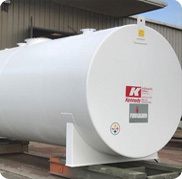 If you are in need of a dependable, experienced source for custom tanks, pressure vessels, heat exchangers, field erection and repair, or related products and services, contact Kennedy Tank. We are ready to put our expertise and commitment to quality to work for your next project.